Our unique Wonderlic practice tests have 150 questions broken down into three realistic tests. Each test includes answers with detailed explanations and tips to help you hone your skills and identify areas that need improvement. 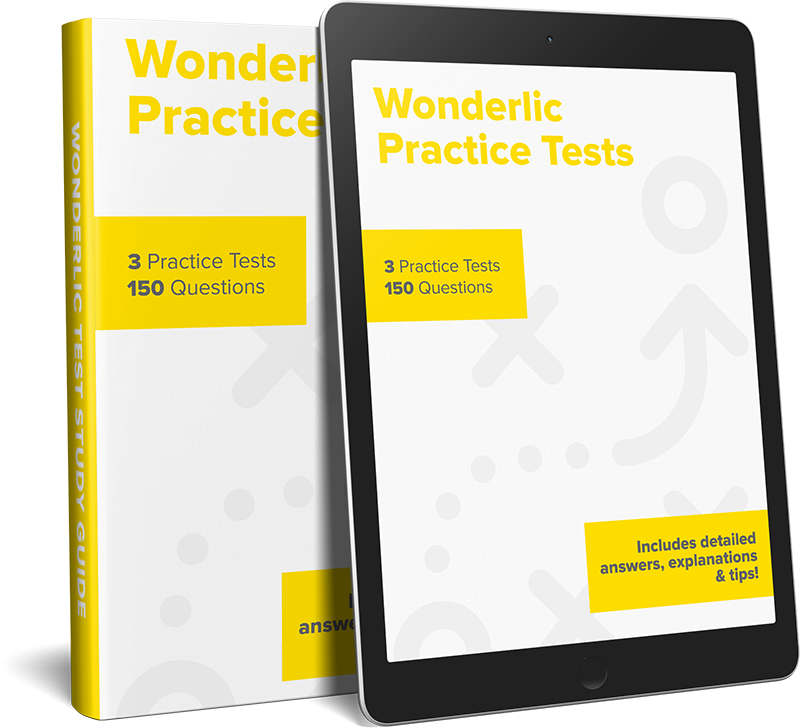 Our Wonderlic practice tests PDF also goes over some of the most common forms of questions you might encounter on the Wonderlic test, and gives you the best strategies for answering them quickly and correctly! Each sample Wonderlic test is crafted to test your understanding of the three most important areas of reasoning. Tests your comprehension of proverbs, idioms, and general knowledge of the English language. Jimmy has been practicing his free throws for months now. Despite his _________ efforts, Jimmy is still the worst free throw shooter on the team. Two friends start at the same point. They walk in opposite directions for 3 meters, then turn left and walk another 3 meters. They turn left again and walk another 3 meters. How far apart are they? Karl owns 28 golf balls. Some are green, some are blue and several are orange. One fourth are red. Are 7 golf balls definitely green? Our Wonderlic Practice Tests PDF helps you prepare for the Wonderlic Test by running you through three timed, full-length, sample Wonderlic tests. By letting you experience a fully representative example of what it's like to take the Wonderlic test, we help prepare you for all eventualities. After you complete a test, you can open its answers section and be guided, step-by-step, through each of the questions you just answered. No more wondering why the correct choice was (b) and not (c). Our explanations are thorough, well-written, and will help you fully understand the reasoning behind each answer. Once you've tallied your final score for a test, you can compare it to the grading scale at the back of the PDF to see where you fall on the bell curve distribution. After understanding the answers, and reading the accompanying tips, we recommend comparing your first test score to your last test score to see how you've improved! Do better on the Wonderlic test with our Wonderlic Practice Tests PDF!